Now’s as good a time as any to get into the sweet sounds and lush arrangements of Philadelphia soul in the 1970s. 2011 marked the 40th anniversary of legendary writer/producers Kenneth Gamble and Leon Huff’s creation of a label that set the groundwork for some of the best soul and R&B sounds of the decade, and this year’s seeing a lot of excellent catalogue projects honoring that legacy. We’ve already told you about Legacy’s Golden Gate Groove: The Sound of Philadelphia Live in San Francisco 1973 (keep an eye out for a review from Joe! ), and there are more great titles in store in the coming months as well. 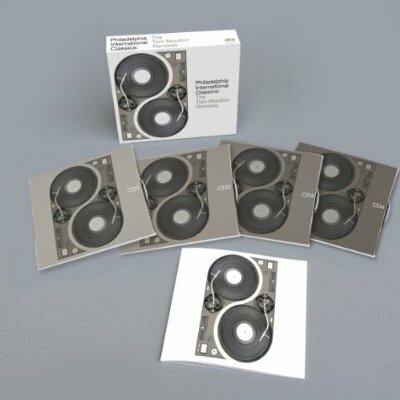 One of them is a stellar four-disc box set that combines the great arrangements of Philly soul with the ace mixing techniques of Tom Moulton. Moulton, the father of the modern-day remix, is about as far from a stranger to Philadelphia International as you can get. In 1977, he mixed classic sides by The O’Jays, The Three Degrees, Harold Melvin & The Blue Notes and MFSB for the double album Philadelphia Classics. Over time, he was commissioned for a variety of other projects for the label, some of which never saw the light of day past a few rarer promo records or obscure compilations. With the release of Philadelphia International Classics: The Tom Moulton Remixes, Harmless Records – a subsidiary of the U.K.’s Demon Music Group – has compiled all eight cuts from Philadelphia Classics and combined them with not only seven rare or unreleased vintage mixes, but another 15 extended versions commissioned just for this set. The Intruders, The Trammps, Billy Paul, Lou Rawls, Teddy Pendergrass – those are just a few of the artists ripe for rediscovery on this set. In addition to the four separately packaged discs, the box will also feature 16 pages of newly-written liner notes by acclaimed British music journalist Lloyd Bradley and rare photos of Moulton at work in Sigma Sound Studios, birthplace for countless classics of the label. The box will be out February 27 in the U.K., and it can be yours to pre-order (for a rather stellar price, given the worth of the music) at Amazon after the jump. Disc 1, Tracks 4-5 and 7; Disc 2, Tracks 3 and 6; Disc 3, Tracks 2 and 5-6 previously released as Philadelphia Classics – Philadelphia International Records PZG 34940, 1977. * denotes newly-commissioned mix by Tom Moulton for this set. All other tracks are rare or commercially unavailable mixes by Tom Moulton. I’ve heard many of the newly commissioned mixes, (through a mutual connection to Moulton himself) and they are STELLAR! Also, Moulton believes that all previous CD masterings of the original Philadelphia Classics disc were done from the EQ’d vinyl masters…and that this will be the first proper remastering of those original tracks from the first generation masters. Harmless/Demon remasters can be hit or miss (Moulton’s Philly ReGrooved 1 was a loud mess of a miss, but ReGrooved 2 was a big improvement), so time will tell if the finished sound will match the ambition of the project. The “rather stellar price” offered by Amazon isn’t nearly as stellar as the one offered by Amazon UK. The Amazon UK price for an American address is £11.66 (£13.99 minus VAT – it shows up in the “place an order” box), plus £3.08 for shipping. That works out to a total of $24.37 at the moment – so ordering that way would save you $11.40, or nearly a third! Amazon US is a pretty bad place to buy UK imports (except sometimes from indie sellers); it’s almost always better (price-wise) to look for UK imports at Amazon UK. In any case, $6.06 per disc from Amazon UK – that’s a really great price!